Matte end make your draw and reholster quicker than ever before. 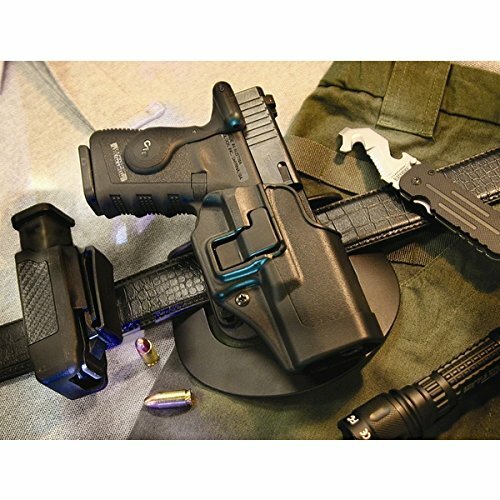 The patented serpa lock in this holster from BLACKHAWK engages the trigger guard as you holster the pistol and does not allow go till you liberate it. The BLACKHAWK CQC carbon fiber serpa active retention holster includes a liberate that may be made the usage of your customary drawing motion, with the trigger finger beside the holster body; as your trigger finger naturally involves rest at the Sherpa lock’s liberate mechanism, merely push the mechanism as you draw the weapon and it releases the gun for a smooth, rapid draw. Very best for One-handed use, the BLACKHAWK CQC serpa Fast draw holster lets in for a fast and easy draw at a moment’s understand. The BLACKHAWK CQC serpa hid elevate holster comes with each belt loop and paddle platforms for a relaxed wear that nobody will find out about however you.